I am using the actual Google Cardboard here.... 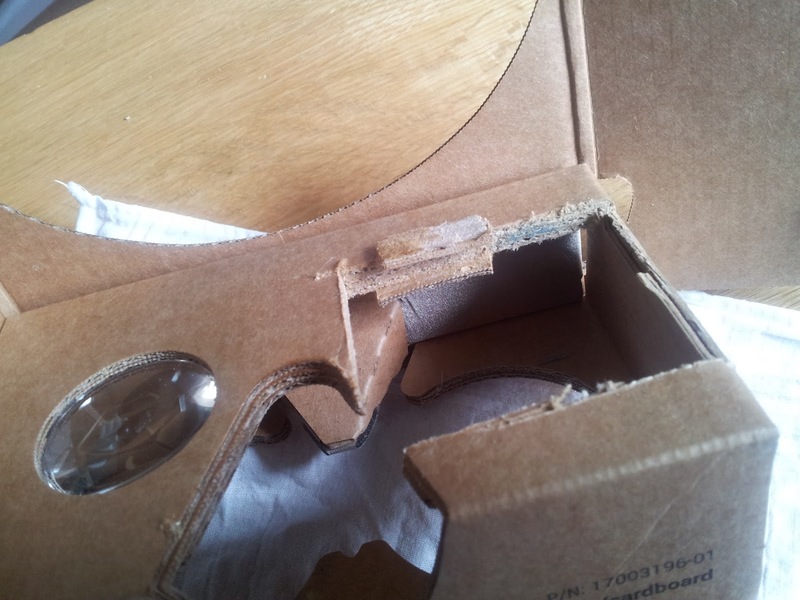 This permanently changes your cardboard - and care must be taken to avoid damage to the lenses. 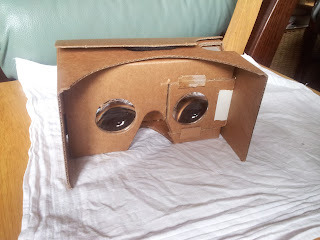 Having searched around the interweb and not found a lot about this I had a close look at cardboard and decided to adapt it with a microsaw, a knife and some glue. I wanted to make the lens spacing adjustable, so at worst I could use it as originally setup - albeit looking a bit the worse for wear! This turned out to be pretty straightforward. I only made one side adjustable as I reckoned I only needed a few mm movement, and could just hold the viewer slightly off centre if necessary. It is really important that while the lens can be shifted a few mm sideways, it does not move closer or further from your eye while doing this. I used a microsaw for most of the cutting - just finished off corners etc. 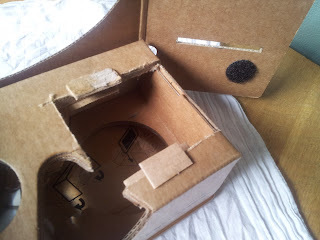 with the craft knife - the cardboard is pretty tough. Here are the pics, detailed instructions below.. 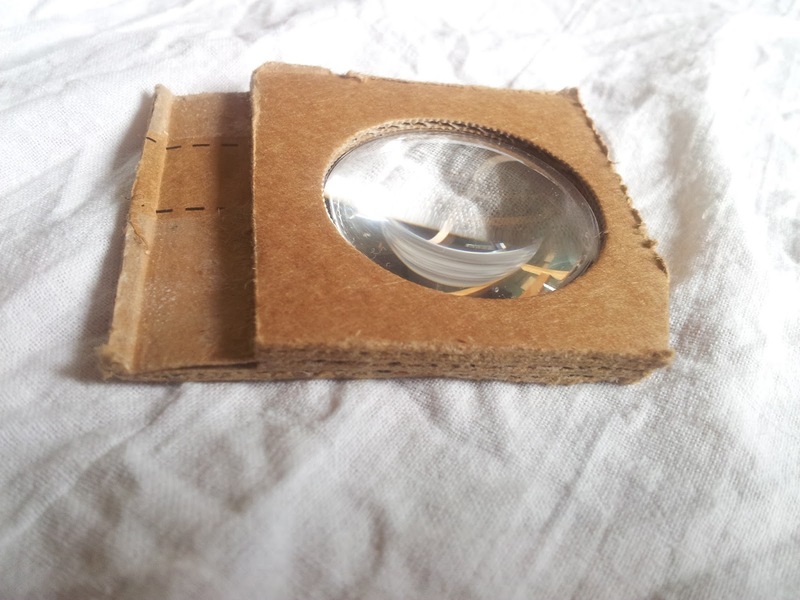 The lens piece cut out and trimmed. Viewed from phone side. card slider again - from eye side. Protect the lens! a couple of small pieces of soft cloth, just larger than the lens, can be placed over the lens and held in place with blutak around the edges. Be careful while doing this - the lenses are easily scratched! Open up the side flaps to allow easier access around the lens. Then cut vertically down from the end of the top cut to the nose gap. 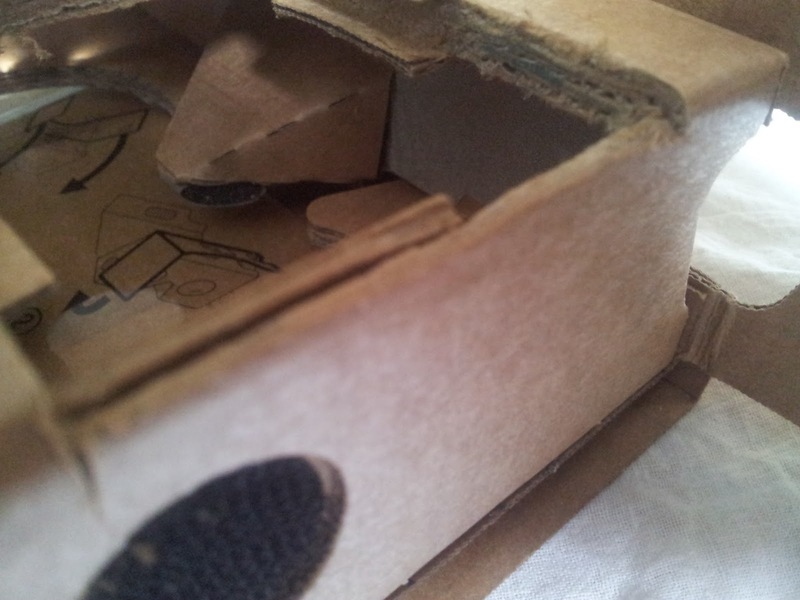 On the side of the cardboard make a correspnding cut at the corner to finally free the lens in its small cardboard rectangle. This rectangle will be able to slide out and in sideways after a few more steps. If you need the lenses to be closer together, trim off some cardboard from the cut out piece and / or from the nose side to allow the lens to slide further into the cardboard. 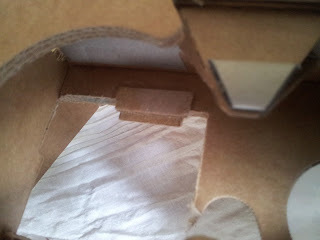 On the piece with the lens, on the side nearest the corner, cut away about 1 cm of 2 of the 3 layers of cardboard. This will allow the piece to slide in and out to the side while the remaining layer will stop it from flapping about too much. Now mark the side flap and cut a slot so the lens can slide in and out with the side flaps back in place. Finally, slide the lens piece in and close the flap. Check and adjust so the lens can slide in and out. A few mm movement is all that is needed, and it helps if it doesn't slide too easily - once set up you should not need to move it again! I suspect cutting out both lenses is not a good idea as it would weaken the overall structure. With just one side the overall integrity is still good. Now the lens spacing is adjustable, it needs to be properly adjusted - part 2 explains this in detail.